American Vampire is badass. It’s common knowledge to most comic folks, even to those that hand out Eisners. American Vampire won for Best New Series you know, and deservedly so: Scott Snyder’s take on vamps takes the bloodsuckers back to their original, animalistic roots in a DC Vertigo series that’s both horrific and superheroic at the same time. If you haven’t, play catch up like I did with the two trades that cover the first two volumes, they won’t waste your time. A third is purportedly on the way. Here with Issue # 20, Snyder keeps his story going and I’ll fess up: I haven’t been into the last few months of the series, at least the monthlies, so I have to piece together the story. The regular ongoing features vampire cuss Skinner Sweet and the lovely protagonist Pearl Jones, who last I saw were in cahoots against a deadly European cadre of vamps in a young Las Vegas. 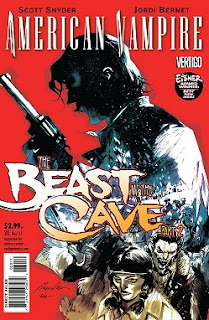 This issue marks the second in an arc entitled “The Beast in the Cave,” a departure from Pearl’s story and it’s about— well, the title kinda spills the beans, don’t it? A young Native American girl jumps at the chance to leave her dreary life as a wife-slave and go all Sacajawea-like through the western frontier with a couple of mysterious hunters. That’s all I can say and still keep this spoiler free but know that Skinner’s pre-vamped self does make a cameo, although it has no real after effect on the rest of the story. The quality from page one all the way to the end from Snyder is no surprise. Where I have to dock the book some points is in the art department: maybe I’m too used to series artist Rafael Albuquerque’s work, but sit-in artist Jordi Bernet’s pencils look too odd to go with the normal vibe of this comic. It just seems out of place, like they belong on some other type book. I dunno, not for me I guess. Still, it’s a book (and a title) worthy of a pickup next time you’re at your local shop.